Explanation: Yesterday's skyscape featured Alnitak, Alnilam, and Mintaka, the stars of Orion's Belt. Today's also presents the easternmost belt star, Alnitak, at the bottom right of the field, surrounded by the well-known Horsehead and Flame nebulae. But this view sweeps farther to the east (left) and north (top) detailing subtler cosmic clouds of gas and dust scattered through the fertile, nebula rich region. The scene is anchored at the top left by the eerie blue glow and ominous dark dust lanes of reflection nebula M78. 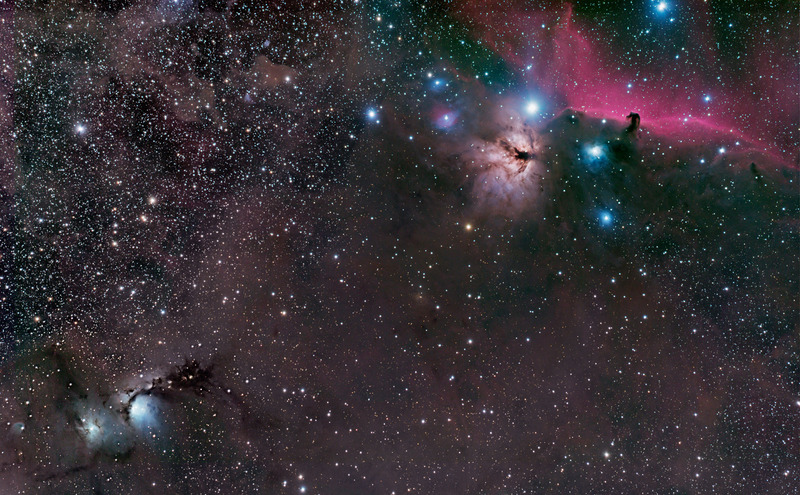 Like the Horsehead, the Flame, and the Orion Nebula itself, M78 is a readily visible part of the large Orion Molecular Cloud complex some 1,500 light-years distant.